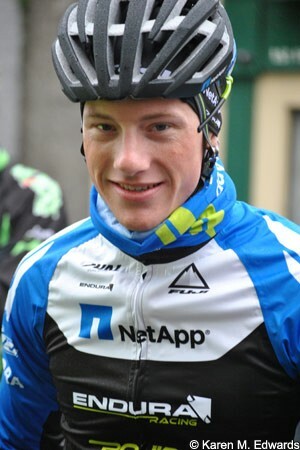 Irish pro Sam Bennett has said that he would jump at the chance to ride the Tour de France in his first year as a pro rider, with a place potentially up for grabs after his NetApp Endura team was given a wildcard to the race today. The German squad was one of four Pro Continental outfits handed invites by Tour organisers ASO; French teams Cofidis and Bretagne – Séché Environnement plus the Swiss team IAM Cycling were also successful in their applications. “It is a great motivation for the team,” Bennett said in response, speaking to VeloNation from his hometown of Carrick on Suir in Ireland. “I think it will definitely push the riders to perform better to get a place on the squad. It’s great news and will give us all a lot of motivation in the races ahead. 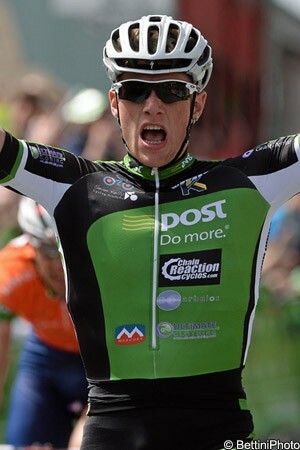 Bennett has spent several seasons with the Continental An Post Chainreaction Sean Kelly team, but secured his step up to the Pro Continental level when he won a stage and finished second in two others at the Tour of Britain in September. He was runner up to Gerald Ciolek (MTN Qhubeka) and Mark Cavendish (Omega Pharma Quick Step) on stages two and eight respectively. He’s a sprinter but also a rider who can get over steep hills with the front group, as his success into Caerphilly showed. While he is yet to ride his first race as a professional with the team and is still just 23 years of age, he said that he would jump at the chance to compete in the Tour de France this year. “I’d love to be able to do a Grand Tour like that in my first season,” he said, motivation clear in his voice. “There are a load of guys who go through their professional career and don’t get to ride it. It would be a great honour to ride it, it would be class. As he points out, plenty of other riders on the team will also be keen to line out in Leeds on July 5th. Does he have an idea what it would take for him to be selected ahead of the others? Bennett has not yet pinned on a number in 2014 but his morale is good and he has been encouraged by how things went for him in recent months. In previous winters he’s had issues with niggling injuries but everything has been clear for him this time round. He’s also avoided illness and been able to get some good work in. He told VeloNation at the start of January that he had his best winter to date, training regularly without any issues. Things have continued in the same fashion since then. In addition to getting out on the bike frequently, he’s also changed his style of training. He’s been coached since last year by the US trainer Neal Henderson and has cut back on long, steady kilometres in favour of some more structured work. That means more specific efforts, something that appears to be agreeing with him. It worked in the second half of 2013 and thus far, he’s feeling upbeat about his form. Bennett did a fitness test towards the end of November and the data from that looked good. His body fat levels were six percent, his power output was close to what he was putting out at the time of the Tour of Britain and his VO2 max was 81.7. “I was happy with that,” he said. Since then he spent two weeks in Mallorca with the NetApp Endura team, continuing to get to know the riders and staff he first met just before Christmas. He said that he was initially nervous about settling in, but things went well and he feels at home now. Encouragingly, things were good in terms of performances as well. “I had really good sensations with the group,” he said. “I was afraid that my power wouldn’t be there in the sprints [after three months away from competition – ed.] but when we were doing sprints, I was going really, really well. “Then we were doing sprint work all week. I was then afraid that because I didn’t have a lot of threshold work done that maybe I would be lacking in that aspect if we were doing up and over on the flat or if we were doing a long climb, for instance. Bennett has been confirmed for the Tours of Qatar and Oman, ASO-organised races which will be held between February 9th and 14th and February 18th and 23rd respectively. Last week team manager Ralph Denk said that he was looking forward to seeing how he can do. “We are particularly curious about Sam, as the first race in a new team is always something special,” he stated. Bennett is also curious. He rode both races three years ago but was only twenty years of age at the time and coming back after several months of injury. He got through both races on that occasion; this time around, he’s hoping to do more than that. “In other years I never really had a winter, but this year it was a really, really good winter,” he said. “On the last training camp I felt really good. To be able to go in and do two stage races straight away is super, I’m looking forward to getting good racing in…hopefully if the legs are good, I can do something on one or two days. It will be interesting. Before flying to Qatar, Bennett and the team will have a chance to further sharpen up. On Saturday he will fly back to Mallorca for several more days training. When he was there earlier this month he said that he was impressed by how the team organised things; he trained in a group of sprinters and said that the team had them do a range of activities. He’ll likely do more of the same on the upcoming camp, carrying out further drills to sharpen his form prior to lining out in Qatar. It remains to be seen if he will be in good racing form right away or if it will take some time to settle in. What’s clear is that if the legs are there, he is hungry to do something good early on. “I would definitely love to hit the season with a bang and try to get an early result,” he said. “I would absolutely love that, but I don’t know how it will turn out. All I can do is try my best. Bennett is aware that some riders try to do too much, too soon. When asked what advice he has been given as he prepares to step up a level in the sport, he said that several people stressed the importance of pacing himself. He believes that he’s balanced things out well and will be able to continue to build his form in the weeks and months ahead. If so, that will position him well in his first pro season. It remains to be seen if he will get the nod for the Tour de France but if he can perform in the sprints like he did in the Tour of Britain, he would be an asset to the NetApp Endura team in big stage races. 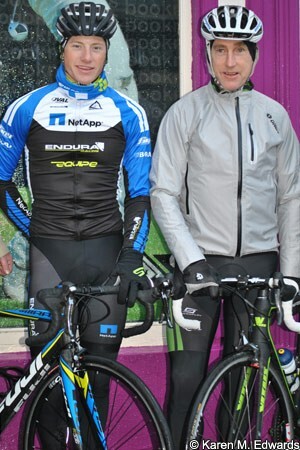 Bennett is from Carrick on Suir, the same town as Sean Kelly [pictured]. He worked alongside the former world number one for several years while part of the An Post team and can draw on continued advice if necessary. Kelly is clear about Bennett’s potential, and would like to see him succeed in the pro ranks. So too others from the same town. In early January riders from his former Iverk Produce Carrick Wheelers club formed a guard of honour in Sean Kelly square, the gesture marking his transition from amateur to pro and linking the club and the rider in a series of photographs. The images will be mementos for the future, and so too the experience of those who were there. If Bennett goes on to have the career that many believe he is capable of, those riders will savour that particular moment. It made an impression on him too. “It was awesome. It was real nice of the guys to come out, because it was absolutely miserable weather,” he said. “Some guys left their homes at half eight, when it was still only getting bright. They came all the way to do that for me. See below: Video of Bennett winning stage five of the Tour of Britain, and also chasing back onto the bunch in the same race after a mechanical issue.